What’s irritated me about the whole direction of politics in the last 30 years is that it’s always been towards the collectivist society. People have forgotten about the personal society. And they say: do I count, do I matter? To which the short answer is, yes. And therefore, it isn’t that I set out on economic policies; it’s that I set out really to change the approach, and changing the economics is the means of changing that approach. If you change the approach you really are after the heart and soul of the nation. 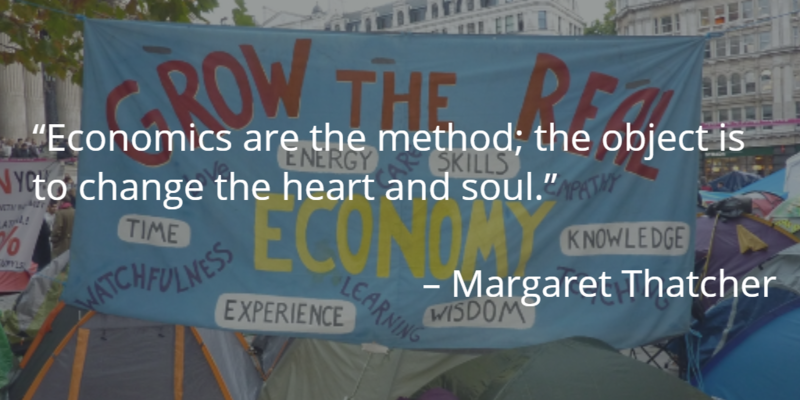 Economics are the method; the object is to change the heart and soul. I think this really gets to the point of the matter. The game has changed. Simply focusing on “better advocacy” will not convince politicians that public libraries (or public services in general for that matter) should be “saved” or invested in. The whole thrust of twentieth century economics has been to change us from a society to a collection of individuals (no matter how nonsensical this philosophy is). The aim has been both to smash the post-war consensus and to devalue public services. Where economics has been the method by which to achieve this, no advocacy campaign can hope to turn the tide. The battleground is not our libraries or even our public services. The battleground is economic theory. If we do not collectively reject, and coherently argue against, the economic orthodoxy, then the battle is lost. Image c/o Simon Q on Flickr. The end of the Second World War in 1945 saw not only an end to the global conflict, but also to the old economic order. The election of the first Labour government in the UK paved the way for a rejection of the economic policies practiced in the pre-war era, and the acceptance of a new model of economic governance – one based on a belief that government intervention in the economy is necessary to create stability and prosperity. However, this adoption of a new economic approach was not solely the preserve of the Labour party; it was also (broadly speaking) accepted by the Conservative Party in what became known as the post-war consensus. An adherence to progressive taxation and redistributive welfare spending. From 1945 to the late seventies, this consensus remained in place with both parties, to varying degrees, ensuring that Keynes’ economic theories remained at the forefront of government policy. This ultimately led to a great post-war boom and a far greater degree of income equality. However, this “consensus” was not without its tensions, with the right-wing increasingly dismissive of this economic consensus. In the mid to late seventies, these tensions finally burst to the surface and led to the termination of the Keynesian approach to managing the economy. The election of Margaret Thatcher in 1979 led to the final breakdown of this post-war consensus (arguably this began with Callaghan’s government going to the IMF and obtaining a loan which came with a variety of conditions regarding the shrinking of the state). Having been largely dismissive of the post-war consensus and the restrictions it placed on corporate Britain, Thatcher launched a programme of (highly unpopular) reforms to the economy. Assets were sold off, old state industries were attacked and the post-war consensus which had at its heart the notion of the “citizen” and “society” was abandoned, explicitly rejecting the latter and embracing a renewed faith in freedom, choice and the power of the individual. The erosion of the “citizen” had begun, replaced with a belief that we are, effectively, no more than consumers and customers who must be unconstrained by the state in a truly free market economic system. “Well, in the old days perhaps. But not now. For they are the party of yesterday. And tomorrow is ours. Whilst this was clearly an attack on Labour, it also signified that, under her premiership, the post-war consensus was dead. It was as much a message to her own side as to the opposition. When she refers to “the party of yesterday” she means a party wedded to the post-war consensus, as Labour remained in the early 80s. When she says “tomorrow is ours” she doesn’t just mean the Conservative Party, she means supporters of her particular brand of conservatism. The “tomorrow” evoked is, clearly, a Thatcherite vision and it is the Thatcherite vision of society that will, in her belief, endure. Indeed, as her next sentence makes clear, not only will it endure but it will be fundamental to a “strong and free” future. This vision was part of the overall belief pushed by her administration that “There Is No Alternative” (TINA). The only path to prosperity is the Thatcherite path; there are no other viable options (and certainly the ‘old’ approach was not to be considered viable). For Thatcher, the only path to ensure security and prosperity was a shrinking of the state and an adherence to free market economics, influenced by figures such as Milton Friedman and Friedrich Hayek. After the economic shock of the 70s and the subsequent IMF bailout, the only way to ensure the country was secure and remained one of the world’s leading economies was to fully embrace the free market, unencumbered by state interference (as they saw it). There was, as far as Thatcher and her supporters were concerned, no alternative. The alternative that was envisioned by Labour was considered archaic, a remnant from a previous age, alien to the realities of the modern world. A rejection of the Thatcherite path was considered a danger to the UK, a manifesto for instability and self-destruction. 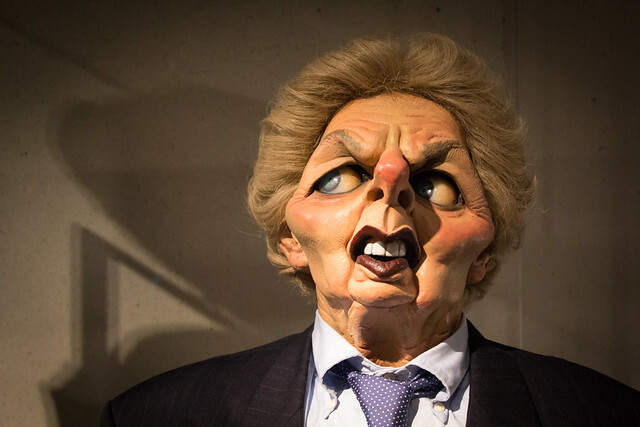 As far as Thatcher and her supporters were concerned, the monetarist counter-revolution influenced by Friedman’s economic ideas was essential to overturn the Keynesian orthodoxy that had existed in the post-war period. TINA has become so deeply ingrained in our society that the Thatcherite ideology has percolated its way throughout our social and political life. We saw, with the emergence of Tony Blair, that even the Labour party cast aside any remaining adherence to the post-war consensus and accepted broad swathes of Thatcherite policy, dispensing with any remaining notion that they could in any way be considered a party of the socialist left. Under Blair, the party adopted the mantra of the free market and trumpeted its ‘values’, ushering in a new era of corporate influence of state infrastructure (see the infamous “Clause 4 Moment”). It now seems barely possible to consider alternatives (say, for example, the raft of policies that were accepted as part of the post-war consensus) without being painted as either a dinosaur from an earlier age, or a dangerous radical. What was once an accepted position across the political establishment, part of a broad consensus, has become either ‘radical’ or old-fashioned. This market orientated doctrine has infiltrated all of our public services and is having a damaging impact upon professions. We have seen, as free market ideas have infiltrated public services, a growth of commercial, corporate language within the public sector. We have seen this in the rise of the use of terms such as “customer” and “marketing” in areas where they once had no place. Our language has become corrupted, commercialised in a way that wasn’t conceivable pre-Thatcher. Whereas once the rhetoric was about citizens and their rights, now it’s about consumers and their choices. This has become so deeply ingrained that rejecting the language of the market is considered backward or dangerous. Staff should be helpful, knowledgeable, welcoming and well-trained. They should be involved in a workforce development programme. Staff in front line customer service roles should be supported by specialists in service planning and promotion, leadership and management, and those areas of service delivery requiring specialist skills and expertise. Coffee bars should be seriously considered by all libraries who don’t have one already. As well as driving up visitor numbers they can generate income and are an opportunity to build links with a local business. Our need to accept this terminology is pushed at us from both within and without the profession. Its use by official bodies (particularly bodies representing the profession) normalises it. The shift to market-orientated approaches that has emerged since the counter-revolution has infiltrated not only our public services, but our professions. The only viable way forward, so it seems, is to accept this reality and orientate our services to ensure a degree of customer services excellence. If we don’t, we risk the stability and long-term future of the service. We are, as the country was in the mid-70s, at a point of crisis. Salvation will come by adopting the language and structures of those that prosper within the free market. Of course there are alternatives. We can ensure the survival and prosperity of both the profession and libraries in general through alternatives to market-orientated rhetoric, just as there are alternatives to liberalised free market economies (see Syriza’s rejection of the austerity orthodoxy). There is a very real danger that we could find ourselves boxed-in, only seeing solutions that have their roots in the market. We wouldn’t be the first profession to make this mistake. Economists themselves made the mistake of believing that the free market, unencumbered by the stabilisation of the state that Keynes advocated, would provide the answers to our economic woes and bring prosperity and stability. As the past seven years have demonstrated, they have been proved utterly wrong. As economist Paul Krugman notes, “Keynesian economics remains the best framework we have for making sense of recessions and depressions.” Economists made a mistake in rejecting alternatives because it believed in the market, we’d do well not to make the same mistake. I guess in many ways there is no real pressing need to share my thoughts on the death of Margaret Thatcher. At the time of writing there have been countless other personal contributions and there is probably very little to add on top of the blogs, news coverage, tweets etc etc. But I’m going to have a go at committing some of my thoughts to writing. I should start by saying that I was born in 1976 and whilst I didn’t directly feel the impact of the Thatcher government, I was aware of it. Up until the age of 14, all I knew was Thatcher as Prime Minister. Even after she left office, it was only when I hit 21 that I saw the end of one Conservative Party, and the beginning of another. There is no doubt, however, that her premiership had an impact on me and it still does to this day. I grew up in a town in the south-east that had a strong socialist worker presence and, despite having a Tory MP, I don’t think anyone could accurately describe it as a town of the right (indeed, it has fluctuated between left and right for decades). I worked with people who had a visceral hatred of her. People who were desperate to see the back of her. She was a divisive character, provoking extreme emotional responses. The news of her death today provoked a mixture of responses from me. I felt that her passing would mean a sort of closure for many people whose lives had been destroyed by her destructive economic policies. But I was also well aware that her death is, in many respects, meaningless. The ideology she espoused of Friedmanite economics, the shrinking of the state, expansion of the private sector and assault on workers’ rights live on to this very day. Indeed, so powerful has this corrosive ideology been, that even the party of the left has caved in to the neo-liberal agenda. Thatcher may have died, but her ideology lives on and will, sadly, live on for some time to come unless progressive forces challenge it effectively and coherently. But I was also angry. Angry because of the way history is currently being re-written. Throughout the day, right-wing commentators have been acclaiming Thatcher as one of our great Prime Ministers. Not only acclaiming her, but demanding that opponents keep quiet as a mark of respect for her passing. Of course, this was not about a mark of respect, but presenting the right with an opportunity to whitewash her record and present her as a modern-day Churchill – a hero who saved this country from destruction. I even saw John Major claim that he can’t think of a single peacetime prime minister in the twentieth century who comes even close to her impact (to which I screamed Attlee at the TV – a man who introduced social security and a National Health Service on the back of the economic crippling of the Second World War…a man who created, rather than destroyed). All the while, her opponents were supposed to remain quiet and allow this whitewash to proceed unhindered…standing by whilst history was re-written before their eyes. Well, Thatcher wasn’t the great Prime Minister that some would have us believe. The truth about the miner’s strike is gradually coming out, with allegations emerging that the police provoked a riot to justify their brutal crackdown on the strike . A crackdown that helped pave the way for the brutal economic policies that followed. Of course, this has all been presented rather differently by Thatcher’s supporters. This isn’t seen as an assault on decent, hard-working people, but as part of a clinical, necessary process to turn the country around. Never mind that public support was won on the back of smears and possible MI5 involvement, this was, as far as the right would have us believe, a regrettable but necessary move. And no matter how hard you try to argue with them, they will remain convinced it was justifiable because, in their minds, it was a crucial step towards ‘saving the country’ and building the Great Thatcher Myth. But it’s not quite so easy to bat away all aspects of her record. In 1999, Thatcher spoke of the‘debt’ the UK owed Augusto Pinochet and thanked him for bringing ‘democracy to Chile’. Pinochet, a man who came to power on the back of a coup against a democratically elected government. A man who murdered many thousands of left-wing opponents of the coup and his subsequent military dictatorship. A man who, alongside other right-wing dictators in South America, had suspected communists murdered across the entire continent. And Thatcher considered this man a friend and a man that she felt the UK was in debt to? A vicious, murderous dictator? And some believe this support for a murderous dictator warranted receipt of the Nobel Peace Prize. Amongst all the talk of Thatcher as being a great and powerful voice for freedom and liberty from her supporters on the right, I have never come across any who have been able to explain away or whitewash her part in enabling the vile Pinochet regime. Sure, they bat away the other criticisms with great ease, claiming that those who argued against them were somehow beholden to vested interests or were simply enemies of progress. Whilst I disagree with that, it’s hard to argue against it (which has perhaps been a general failing of the left, a coherent argument that the vast majority can rally around). I can’t possibly comprehend how anyone can put forward a coherent, moral defence of her support for Augusto Pinochet. This support will, for me, always be her legacy. And it will be what I tell my children of her. Because I don’t want that aspect of her record to be eradicated as part of a drive to present her as a ‘great leader’. Economically speaking, there is no doubt that the Thatcher legacy lives on. We see it all around us, in the world that she has created for us (a world, incidentally, where she gets the credit for the positive consequences of her actions, but must not be criticised for the negative consequences – social breakdown etc). We see it in the way those on benefits are demonisedon a daily basis. We see it in the way the Conservative and Liberal Democrat parties are hastening the end of the National Health Service (a service created by a truly great and courageous leader). We see this in the way that the poor are divided between those who are deserving and those who are not. We see it in the way that those who must pay for the banking crisis are not the bankers or the financial sector, but the poor. We see it in the way that democratic accountability is eroded as public services are shifted to the private sector and removed from public scrutiny. For me, Thatcher will be remembered both for her support for vile regimes and for her destructive economic policies. We must ensure that her public record is not whitewashed to present her as the great leader the right demand. But, more importantly, progressives must make a concerted effort to undo the Thatcher Legacy rather than adopt a watered down variant (Labour). Her legacy should be confined to the history books, but only as a footnote.